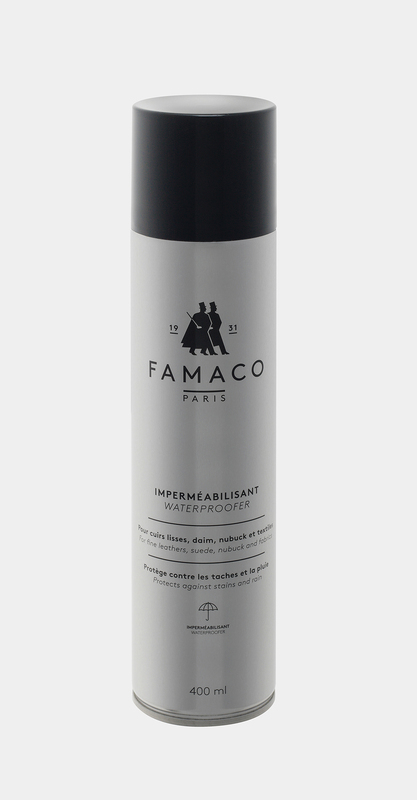 The Imperméabilisant is a Waterproof protector that offers water and stain resistance. It can be applied to leather, suede, nubuck and fabrics material. Remove dust or dirt with a Famaco brush, hold can 25 cm away & spray in short bursts, avoid overspraying, leave to dry for 10 minutes. The Mousse Nettoyante is a cleaning foam which gently eliminates stains and revives the colours. Remove dirt with a Famaco brush. Apply the foam by using a Famaco cloth. Do circular movements to clean the shoes and eliminate the stains. Fa16 helps to soften new leather. Stretches tight shoes. Spray the inside of the shoe in the area which causes discomfort. Wear the shoe whilst it dries. Repeat the action if necessary. Détacheur Universel is a universal cleaner which eliminates stubborn stains on leather and fabrics. Shake the bottle, dampen the stained area with the product, brush or rub in with a cloth, leave to dry, then buff. Multi+ can be applied to smooth leather, suede, patent and fabrics. It protects, conditions and restores colour. Remove dust or dirt with a Famaco brush, hold can 25 cm away & spray in short bursts, avoid overspraying, leave to dry for 10 minutes, then brush the material. Remove dust or dirt with a Famaco brush, hold can 20 cm away & spray in short bursts, avoid overspraying , then apply using a sponge (for leahter) leave to dry (for suede). Color Fix stops colour from staining your feet, socks, tights or stockings. Hold can 20 cm away & spray the interior of the shoe in short bursts, avoid overspraying, leave to dry, repeat the application twice.